Using the L400 in 4H, locked dif and low ratio gears, on a hard surface, with different sized wheel / tyre combinations on the front and rear axles will result in 'Wind up' this relates to the difference between the front wheels speed of rotation compared to that of the rear wheels when the difflock is engaged. Even small differences in rotational speed between the front and rear wheels cause a torque to be applied across the transmission. 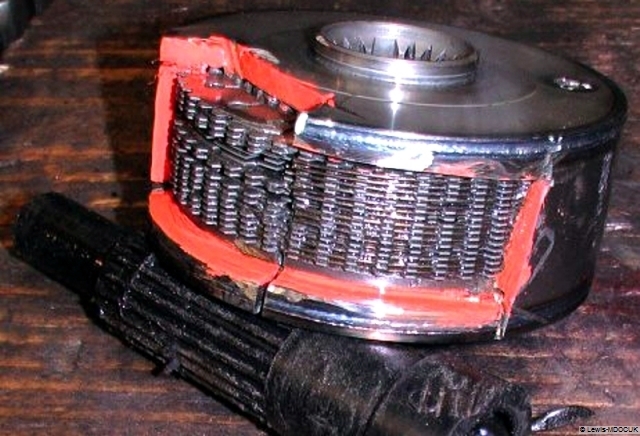 It is that force that is known as "wind-up", which causes damage to the transmission or drive train. On loose surfaces these differences are absorbed by the tyre slippage on the road surface. The L400 transfer case incorporates a viscous center differential (which can be locked into place - 'Difflock') that allows the drive shafts to spin at different speeds. This allows it to be driven on hard surfaces (tarmac) without experiencing "wind-up". When the floor-shift lever is pulled back to the rearmost setting the Deli will be in two wheel drive mode (2WD). Two green lights on the dash unit will indicate the rear wheels only are being driven. One position forward is four wheel drive mode (4WD), this actually gives you more control and road holding on corners. Two additional green dash lights will indicate front wheels are being driven. You can drive in 2WD or 4WD on roads or off road with no problems. The Superselect gears allow the vehicle to move into or out of 4WD whilst moving at speeds up to 60mph (100Kmh), as stated in the Mitsubishi Manual. The next position forward is the difflock, for when in more difficult off-road terrain, the orange difflock light will come on. Difflock is not used on tarmac or paved roads. It can also be engaged whilst moving on slippery surfaces, according to the manual, I have done this in low speeds pnly. The last position that the floor lever goes into requires you to press the lever downwards on itself, then move it to the right and forward. That engages the low gear range, for use off-road in particularly difficult terrain as required. Flashing green or orange lights indicates the transition phase between 4WD / Difflock / 2WD gear selections. Sometimes these continue flashing, requiring you to reverse for 30-40 yards to disengage the switch sensor. This is often due to lack of use of the 4WD system. Continued flashing lights indicate a faulty switch/sensor, or a problem in the vacuum servo air lines, such as an air leak. Note though; that provided you have taken the floor gear selector lever back to 2WD the 4WD system and Difflock will not be engaged. It will be safe to drive, but have the system checked. The centre diff incorporates a viscous unit, which is basically two sets of intertwined discs inside a sealed unit full of a sticky heat sensitive silicone type liquid. One set of discs is fixed to the engine side by the outer edge of one set of discs, which turn constantly with the engine. The alternate set is fixed by the inner edge of the other set of discs, which also rotate, but essentially much slower and without power. When the rear wheels start to lose traction the centre diff spins faster. The fluid inside the unit gets hotter and starts to gel, getting thicker, The friction created then drags the other set of disks round. That causes more & more power to be sent to the front diff until both prop shafts are turning at the same speed (50-50). A sensor notes the increase in power output to the front wheels and switches a solenoid that creates a vacuum which causes the front wheel autohubs to lock into the front wheels. When the rear wheels regain traction the centre diff slows down and the fluid cools and returns to its normal thin, but sticky, consistency and reduces the power input to the front diff and the autohubs disengage. Note Locking the centre diff bypasses the viscous effect and mechanically locks both diffs to the powerdrive activating the sensor that creates the vacuum to lock the autohubs in place. Posted: Wed Nov 07, 2018 11:09 Post subject: Google Ads keep this community free to join!